Misread Signs is an exhibition of new work and performance by Yuliya Lanina. 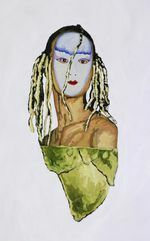 Exploring the effects of trauma on the human psyche, the exhibition begins with her signature paintings of collaged, malformed characters that later come to life in a three-channel, immersive animation. The show will culminate with 3 days of a multimedia performance by Lanina, done in collaboration with composer José Martínez and choreographer Andrea Ariel, featuring animatronic sculptures, projected animation, music, and movement. 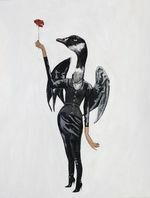 Donned as one of her feathered creatures with antlers, Lanina performs within the projected animations, illuminated solely by her anthropomorphic sculptures – skeletal birds with human baby heads and phosphorescent eyes. The animation fills a quarter of the gallery, creating a seamless immersive story. In the course of the performance, we see Lanina desperately trying to tell us something and being unable to. Based on her personal life story, this piece examines the inability for someone who experienced trauma to express and at times even connect with how they feel. Lanina’s images are inspired by the Surrealist and Dada approach, with the subconscious taking the lead, and leaving analytical thinking behind, and by embracing the nonsensical and surprising. By exploring the life of fantastic and bizarre creatures, the artist is able to reach places unavailable to her rational self, inviting the audience to do the same. In this piece, most of the characters on the screen are masked. At first, they are aloof, unmoved by Lanina’s pleas; Later, they urge her to, “let go of the past,” a sentiment re-addressed by Lanina to the audience. The piece transcends the particulars of artist’s life experience into a universal story of perseverance and asks us to reflect on our connection to ourselves, to our past and to each other. Technical support by Theodore Johnson and Michael McKellar.